Film Connection graduate Steven Pitts is Building a Bright Future in Film! 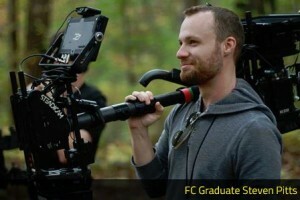 Steven Pitts enrolled in Film Connection in 2011 and graduated in 2012 after apprenticing with Steve Carmichael at Radiant3 Productions in Atlanta, GA. Since then, Steven Pitts has continued building a bright future for himself by getting in there, signing onto projects, and doing the work. He’s become a member of the Atlanta-based film collective, Rite Media Group, serving as director, 2nd Unit Director and cameraman on projects that range from commercial to horror to art-house. Pitts recently directed two national spots: a commercial for Coca-Cola and new The Weather Channel app for Android smartphones. Take a look at the Rite Media Group website and it’s easy to see that something pretty unique is happening there. Curious to find out more, we decided to check in with Steven to talk a bit about what’s going on in his world. RRF: How did you meet up with the other people who became Rite Media Group? Steven Pitts: Actually, we came together quite organically. The two founders of the company started it in 2010, just loosely doing music videos. One of them is an artist. The other one is a music producer, so, originally, they were working together musically. Then they were like, “We need some visuals to go along with this,” so they started shooting stuff. During this time they met one of our other core members that started it, Colin Quinn, who’s now our Director of Photography and our editor, and is insane at what he does. I met Colin and we started shooting a few projects here and there. RRF: It seems like there isn’t much ego or friction at Rite Media. Is that what happens when everyone’s just focused on the work and has the skills they need? Steven: And even if they don’t, they’re eager and willing to listen. [With] people that are new on set, I feel like 80% of it is just a matter of paying attention to what’s going on around you. If you have people that are willing, eager, and ready, even if they aren’t so experienced or knowledgeable, it still can turn a great product. It helps if they’re artistic too. Another element that helps [us] too is that we’re all best friends, so when it comes to helping each other finish what we started and what we came out to do, we all will pitch-in and eliminate the hierarchy that’s on set. I’m not opposed to helping the guys unload a truck at the end of the day after I’ve been directing. RRF: Do you have any pet projects you’re working on? Steven: Actually, there’s one thing we have that I think is pretty huge. We’ve developed our own lights that we call the “Rite Lites.” They’re high output LEDs that we think are going to revolutionize the film set, especially the indie world, because with them we can get the same amount of light as big expensive lights. We’re currently in the process of patenting the housing for them. They’re prototypes right now, but we have a full variety, and we’ve actually lit an entire feature film with them. We didn’t use a single incandescent light at all, they’re all LEDs. So far I think we’ve shot four music videos after we wrapped the feature, and we even lit Bill Clinton with them. RRF: Wow! Did you get to film Bill Clinton? Steven: We didn’t film him, we just lit him. He was giving a speech for the state elections we just had recently. He was speaking on behalf of a potential Georgia congresswoman. I went there the night before and helped set up the lights. We lit basically for the camera crews and for the entire event there. RRF: You apprenticed with Steven Carmichael at Radiant3 Productions in Atlanta. What was your experience like with him and the Film Connection? Steven: It was great. Steven Carmichael is definitely a wealth of knowledge. I learned a lot. I’d been working for a TV show as a field producer, but it was reality style, and I didn’t have a broad knowledge of what I wanted to know. I was always wanting to direct. Directing is my passion and I wanted to know how to do things properly. Best of luck with the Rite Lite to everyone at Rite Media Group. Keep on building that bright future! Directed by Paris Schulman and Produced by Rite Media Group in Atlanta, GA.